There are 265 posts filed in Wandsworth (this is page 3 of 27). Reporting, again, a pothole on Kingsley Street for repair made me realise what austerity actually means for most people: and it’s not that much. I’m just about old enough to vaguely remember pundits who made a living from Kremlinology and divining some meaning from the scraps of information that escaped Red Square. Last night was my first full council meeting as an independent councillor, and in some ways one of the more interesting meetings I’ve attended, because I could attend and make up my own mind rather an having each of my votes pre-determined by the whip. I took in Battersea Park on my morning run today. It is, again, open to mere mortals although a lot of evidence of Formula E remains. My route took me around the carriage drives, which were more or less fully open, although possibly more through oversight and perhaps not likely to remain that way all day, although there were no barriers, signs or security guards when I was there. All around the park are collections of the fencing, concrete blocks and various bits and pieces of kit. Carriage Drive South was by far the worst, giving the impression that workers simply dropped everything where they stood yesterday ready to resume work this morning. The terracing and footbridge remain in place there. 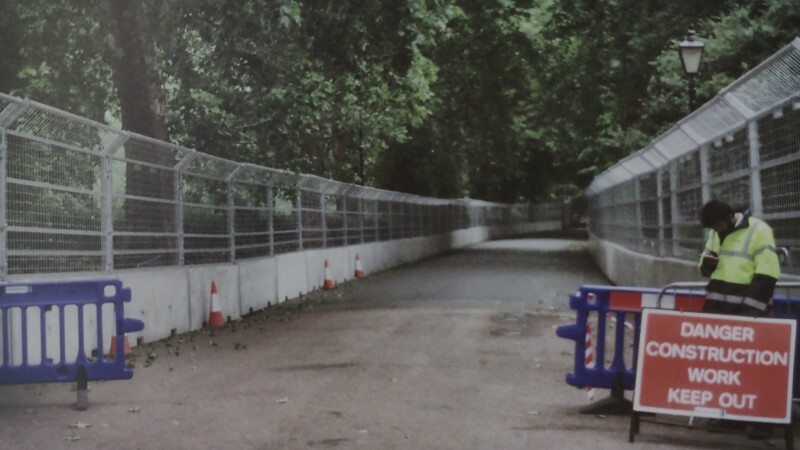 Generally the concrete blocks have been removed from the course, although it looks like the barriers have still to be removed from the central road and the area around the junction with Carriage Drive East. The only bit I couldn’t use was the new dual carriageway part of Carriage Drive West, where the amount of fencing and plant piled up meant I had to run on the tarmac where the boules area used to be. So, you can get in and seem to be able to access most bits, but I suspect parts of the park will need to be closed off. A lot of freestanding fencing has been installed that I expect will be used to limit movement during work today. If nothing else there will be a lot vehicle movements there today, I spotted lots of forklifts and a couple of idling lorries. Sadly, I must also report that I didn’t find the overnight tarmac job (which was impressive, when I report a pothole it takes three weeks for an acknowledgement!) on turn one made my run any faster at all. When I found myself unable to support Formula E in Battersea Park I was perfectly content with being in a minority position. I’ve now voted against my group in council not once, but twice: on ward budgets and against Formula E in Battersea Park. I’m becoming a dangerous rebel.